Legendary rock act Guns N’ Roses is coming to Arrowhead Stadium this week, and Tickets For Less offers will offer an experience like no other at the show. Tickets For Less will have its VIP tent open for the very first time since partnering with Arrowhead Events. The tent will be situated right in front of Arrowhead in Lot M. Those who have tickets to get into the tent can enjoy free drinks and catering from HyVee at the event. Starting today, the first 50 purchasers of Guns N’ Roses tickets from Tickets For Less will receive a free ticket for admission to the VIP tent before the show. Call 913-685-3322 now to buy your Guns N’ Roses tickets, and mention our free VIP tent ticket offer. 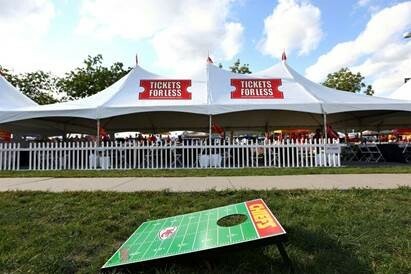 With the announcement of a partnership between Tickets For Less and Arrowhead Events in early June, the Tickets For Less VIP tent was established. Now, for every ticketed Arrowhead Stadium event, Tickets For Less will host a VIP tent beforehand. This includes football games and concerts. Tickets For Less is an Overland Park, Kans.-based ticket seller. We are one of the biggest sellers in the country of Kansas City Chiefs, Kansas City Royals, Kansas Speedway and Sprint Center tickets. To order, call 913-685-3322 or visit our website.